The anarchists were trade union organisers and May Day became an international workers day to remember their sacrifice. They were framed on false charges of throwing a bomb at police breaking up a demonstration in Chicago. This was part of a strike demanding an 8 hour day involving 400,000 workers in Chicago that started May 1st 1886 . Not many people know why May Day became International Workers Day and why we should still celebrate it. It all began over a century ago when the American Federation of Labour adopted an historic resolution which asserted that "eight hours shall constitute a legal day's labour from and after May 1st, 1886". In the months prior to this date workers in there thousands were drawn into the struggle for the shorter day. Skilled and unskilled, black and white, men and women, native and immigrant were all becoming involved. In Chicago alone 400,000 were out on strike. A newspaper of that city reported that "no smoke curled up from the tall chimneys of the factories and mills, and things had assumed a Sabbath-like appearance". This was the main centre of the agitation, and here the anarchists were in the forefront of the labour movement. It was to no small extent due to their activities that Chicago became an outstanding trade union centre and made the biggest contribution to the eight-hour movement. When on May 1st 1886, the eight hour strikes convulsed that city, one half of the workforce at the McCormick Harvester Co. came out. Two days later a mass meeting was held by 6,000 members of the 'lumber shovers' union who had also come out. The meeting was held only a block from the McCormick plant and was joined by some 500 of the strikers from there. The workers listened to a speech by the anarchist August Spies, who has been asked to address the meeting by the Central Labour Union. While Spies was speaking, urging the workers to stand together and not give in to the bosses, the strikebreakers were beginning to leave the nearby McCormick plant. The strikers, aided by the 'lumber shovers' marched down the street and forced the scabs back into the factory. Suddenly a force of 200 police arrived and, without any warning, attacked the crowd with clubs and revolvers. They killed at least one striker, seriously wounded five or six others and injured an indeterminate number. Outraged by the brutal assaults he had witnessed, Spies went to the office of the Arbeiter-Zeitung (a daily anarchist newspaper for German immigrant workers) and composed a circular calling on the workers of Chicago to attend a protest meeting the following night. The protest meeting took place in the Haymarket Square and was addressed by Spies and two other anarchists active in the trade union movement, Albert Parsons and Samuel Fielden. Throughout the speeches the crowd was orderly. Mayor Carter Harrison, who was present from the beginning of the meeting, concluded that "nothing looked likely to happen to require police interference". He advised police captain John Bonfield of this and suggested that the large force of police reservists waiting at the station house be sent home. It was close to ten in the evening when Fielden was closing the meeting. It was raining heavily and only about 200 people remained in the square. Suddenly a police column of 180 men, headed by Bonfield, moved in and ordered the people to disperse immediately. Fielden protested "we are peaceable". At this moment a bomb was thrown into the ranks of the police. It killed one, fatally wounded six more and injured about seventy others. The police opened fire on the spectators. How many were wounded or killed by the police bullets was never exactly ascertained. A reign of terror swept over Chicago. The press and the pulpit called for revenge, insisting the bomb was the work of socialists and anarchists. Meeting halls, union offices, printing works and private homes were raided. All known socialists and anarchists were rounded up. Even many individuals ignorant of the meaning of socialism and anarchism were arrested and tortured. "Make the raids first and look up the law afterwards" was the public statement of Julius Grinnell, the state's attorney. Eventually eight men stood trial for being "accessories to murder". They were Spies, Fielden, Parsons, and five other anarchists who were influential in the labour movement, Adolph Fischer, George Engel, Michael Schwab, Louis Lingg and Oscar Neebe. The trial opened on June 21st 1886 in the criminal court of Cooke County. The candidates for the jury were not chosen in the usual manner of drawing names from a box. In this case a special bailiff, nominated by state's attorney Grinnell, was appointed by the court to select the candidates. The defence was not allowed to present evidence that the special bailiff had publicly claimed "I am managing this case and I know what I am about. These fellows are going to be hanged as certain as death". The eventual composition of the jury was farcical; being made up of businessmen, their clerks and a relative of one of the dead policemen. No proof was offered by the state that any of the eight men before the court had thrown the bomb, had been connected with its throwing, or had even approved of such acts. In fact, only three of the eight had been in Haymarket Square that evening. No evidence was offered that any of the speakers had incited violence, indeed in his evidence at the trial Mayor Harrison described the speeches as "tame". No proof was offered that any violence had been contemplated. In fact, Parsons had brought his two small children to the meeting. That the eight were on trial for their anarchist beliefs and trade union activities was made clear from the outset. The trial closed as it had opened, as was witnessed by the final words of Attorney Grinnell's summation speech to the jury. "Law is on trial. Anarchy is on trial. These men have been selected, picked out by the Grand Jury, and indicted because they were leaders. There are no more guilty than the thousands who follow them. Gentlemen of the jury; convict these men, make examples of them, hang them and you save our institutions, our society." On August 19th seven of the defendants were sentenced to death, and Neebe to 15 years in prison. After a massive international campaign for their release, the state 'compromised' and commuted the sentences of Schwab and Fielden to life imprisonment. Lingg cheated the hangman by committing suicide in his cell the day before the executions. 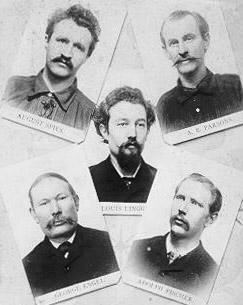 On November 11th 1887 Parsons, Engel, Spies and Fischer were hanged. 600,000 working people turned out for their funeral. The campaign to free Neebe, Schwab and Fielden continued. On June 26th 1893 Governor Altgeld set them free. He made it clear he was not granting the pardon because he thought the men had suffered enough, but because they were innocent of the crime for which they had been tried. They and the hanged men had ben the victims of "hysteria, packed juries and a biased judge". The authorities has believed at the time of the trial that such persecution would break the back of the eight-hour movement. Indeed, evidence later came to light that the bomb may have been thrown by a police agent working for Captain Bonfield, as part of a conspiracy involving certain steel bosses to discredit the labour movement. When Spies addressed the court after he had been sentenced to die, he was confident that this conspiracy would not succeed. "If you think that by hanging us you can stamp out the labour movement... the movement from which the downtrodden millions, the millions who toil in misery and want, expect salvation - if this is your opinion, then hang us! Here you will tread on a spark, but there and there, behind you - and in front of you, and everywhere, flames blaze up. It is a subterranean fire. You cannot put it out". Over a century after that first May Day demonstration in Chicago, where are we? We stroll though town with our union banners - about the only day of the year we can get them out of head office. Then we stand around listening to boring (and usually pretty meaningless) speeches by equally boring union bureaucrats. You have to keep reminding yourself that May Day was once a day when workers all over the world displayed their strength, proclaimed their ideals and celebrated their successes. It is important that "once upon a time" it was like that. We can do it again. We need independent working class politics. No collaboration with government and bosses. Real solidarity with fellow workers in struggle, not a blinkered sectional outlook. We still need a further reduction in working hours, without loss of pay, to make work for the unemployed. We need revolutionary politics. That means politics that can lead us towards a genuine socialism where freedom knows no limit other than not interfering with the freedom of others. A socialism that is based on real democracy - not the present charade where we can choose some of our rulers, but may not choose to do without rulers. A real democracy where everyone effected by a decision will have the opportunity to have their say in making that decision. A democracy of efficiently co-ordinated workplace and community councils. A society where production is to satisfy needs, not to make profits for a privileged few. Anarchism.